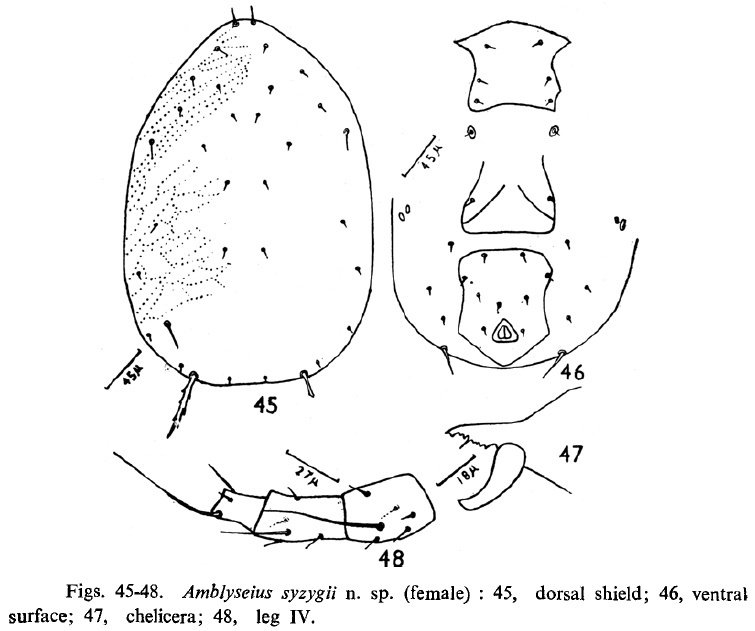 Gupta's (1975) original figures for Amblyseius syzygii. For this week's semi-random post, I drew the mite species Amblyseius syzygii. Or perhaps that should be Typhlodromips syzygii, as it's more likely to be designated now. Typhlodromips syzygii is a member of the Phytoseiidae, a diverse family of about 1600 known species of predatory mite. Despite, or perhaps because of, their being an economically significant group (more on that in a bit), phytoseiids have been somewhat plagued by competing nomenclatural systems. Until relatively recently, they were predominately classified into just a few, very large genera. 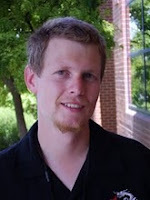 In the last couple of decades, however, there has been a move towards a much more finely divided classification, but you will still find many sources that will continue to use the more conservative system, particularly among those with more of an economic interest in the group than a taxonomic one. It is as a result of this taxonomic changing of the guard that syzygii, once nestled in the broad genus Amblyseius, has been separated as part of a genus Typhlodromips that was placed by Chant & McMurtry (2005) in an entirely separate tribe from its former host. The genera are separated by features such as the number, shape and proportions of the dorsal setae, and the arrangement of macrosetae on the legs. 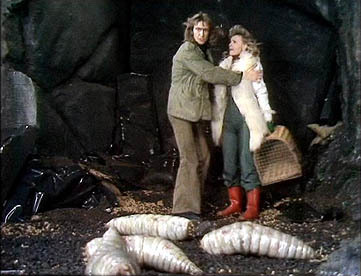 In fact, counting setae seems to be a major part of taxonomy in the Mesostigmata (the major mite group to which the phyoseiids belong) as a whole, which is part of why this is one group of mites I've so far had difficulty in coming to terms with. Counting setae sounds like it should be easy, but in my experience it's usually not. Especially when the animal is slide-mounted, requiring you to move to focus on the microscope up and down in order to see all the setae, leading to confusion about whether a given visible setae is one you've already counted or not. Anywho, even after the split, T. syzygii is one of about sixty species in its genus. It was first described in 1975 from West Bengal, from a specimen collected on a jambul tree Syzygium cumini (Gupta 1975; hence the species name). Since then, it has been recorded all around southern and eastern Asia, and from a wide variety of different plants. 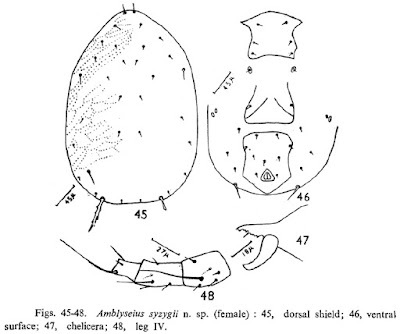 Distinguishing features of the species include (again) proportions of the dorsal setae, with T. syzygii possessing features such as a pair of large posterolateral serrate setae, as well as details such as the shape of the ventral plates on the body. 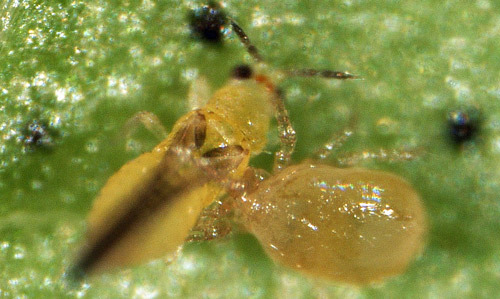 A related amblyseiid, Amblyseius swirskii, attacking a thrips. Copyright Steven Arthurs. I referred before to the economic significance of phytoseiids. This is because a number of species in this family have been utilised as biocontrol agents for plant-feeding mites and other minute pests such as thrips. In some places, you can even buy commercially-produced satchels containing colonies of phytoseiids that can be hung in an orchard and allow the mites to disperse among your trees (arachnids in a bag, people, arachnids in a bag). Alternatively, industrial-size blowers may be used to fire clouds of mites across a crop. I have come across reference to Amblyseius syzygii as a predator of the tea red spider mite Oligonychus coffeae, a significant crop pest. The use of phytoseiids in pest control has, in turn, lead to a massive amount of research on phytoseiid distribution, prey preferences, and pesticide resistances (some phytoseiids can be applied in combination with pesticides that affect the target pest but not the phytoseiids). However, this has also required a lot of attention to phytoseiid taxonomy. For all that phytoseiid species may be obscenely difficult to distinguish, even closely related species may vary significantly in each of the aforementioned factors. For instance, Beard (1999) refers to a number of morphologically all-but-indistinguishable but behaviourally distinct species/populations/whatever that have been identified as the biocontrol 'species' Neoseiulus cucumeris. Some strains might be found only on low-growing plants and never on trees, others may be quite high above the ground. Some may cluster around the flowers of their host plants, others may prefer the fruits and/or young leaves. And they might differ in prey preferences: of two strains found in Britain, one would munch quite happily on the broad mite Polyphagotarsonemus latus, the other would refuse to touch it. Obviously, introducing the wrong strain in a pest control effort could lead to a lot of money being spent on a futile attempt. Beard, J. J. 1999. Taxonomy and biological control: Neoseiulus cucumeris (Acari: Phytoseiidae), a case study. Australian Journal of Entomology 38: 51–59. Chant, D. A., &. J. A. McMurtry. 2005. A review of the subfamily Amblyseiinae Muma (Acari: Phytoseiidae): part VII. Typhlodromipsini n. tribe. International Journal of Acarology 31 (4): 315–340. Gupta, S. K. 1975. Mites of the genus Amblyseius (Acarina: Phytoseiidae) from India with descriptions of eight new species. International Journal of Acarology 1 (2): 26–45. Why is an Oak like a Cassowary?